Today was the group’s first day off of lab work since we arrived in Puerto Rico, and we capitalized on the opportunity to visit the island’s premier engineering school: University of Puerto Rico, Mayagüez. 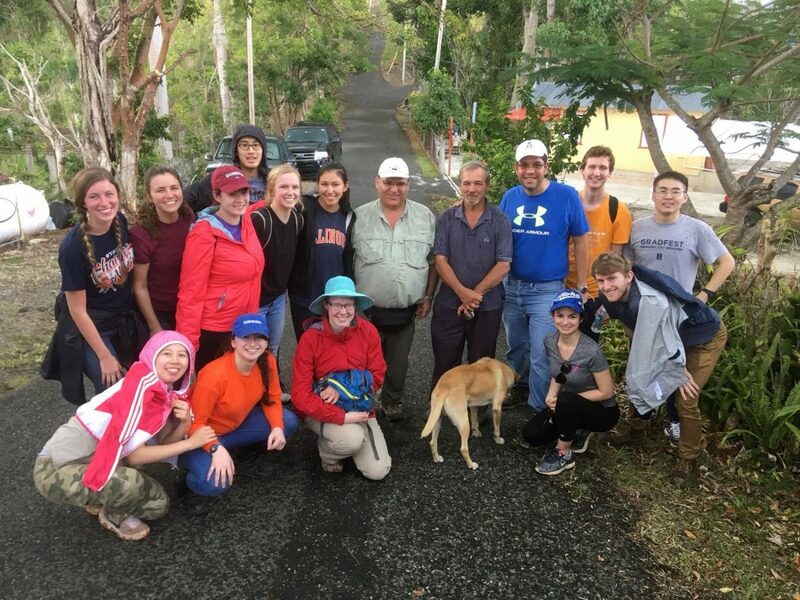 Throughout the week Madeline Torrez had been helping us navigate our way through the mountain sides of Puerto Rico, and today she showed us her home institution where she teaches as a Professor in the Chemical Engineering Department. 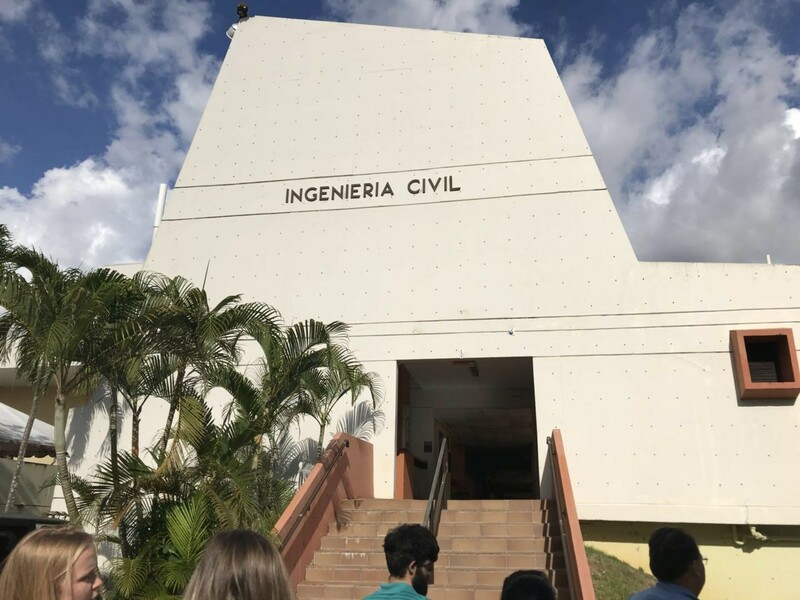 When we first arrived at UPRM, professors in the college of engineering gave us a presentation about major research initiatives at the university. 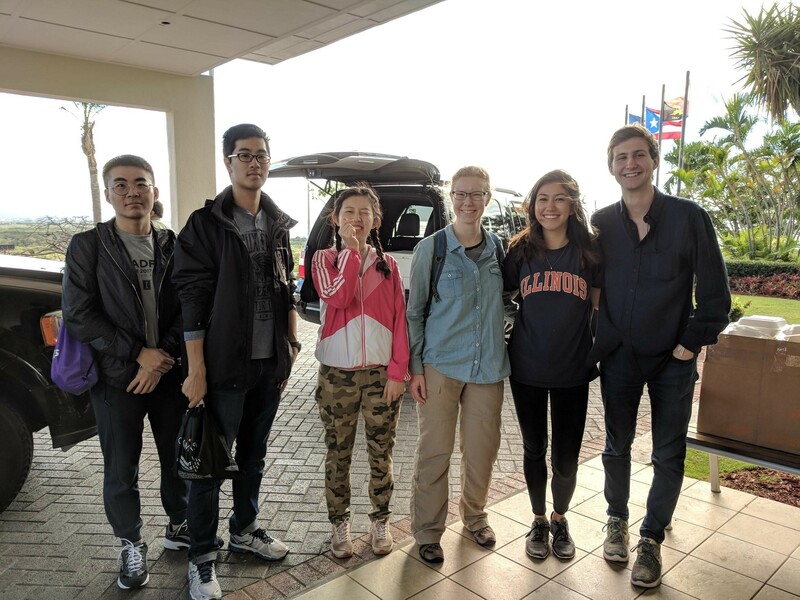 They ranged from material science research projects focused on membrane design to education efforts in local schools to try and promote students in Puerto Rico to consider careers in Engineering and the Sciences. 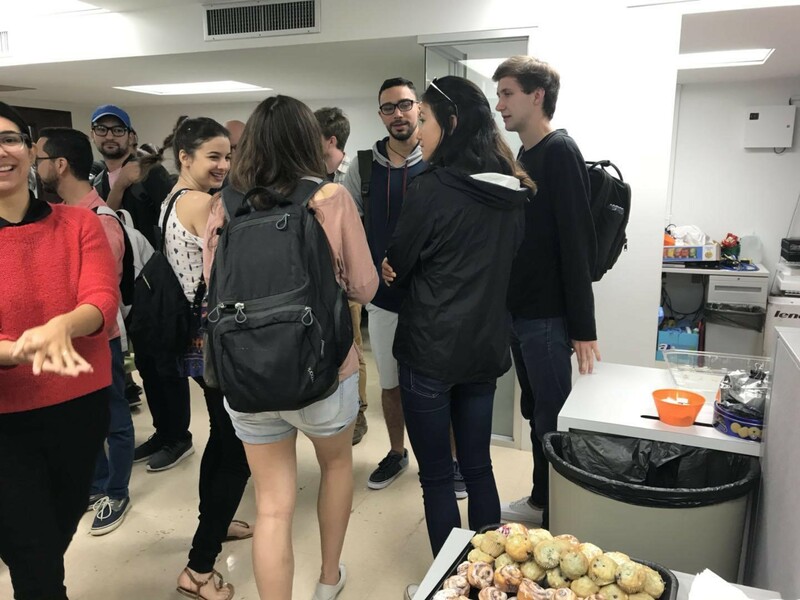 In addition to presentations from professors at UPRM we enjoyed the company and introduction to a number of undergraduate and graduate students in different science and engineering disciplines from chemistry to Biological and Chemical Engineering. We were treated to coffee (George was thrilled) and snacks. 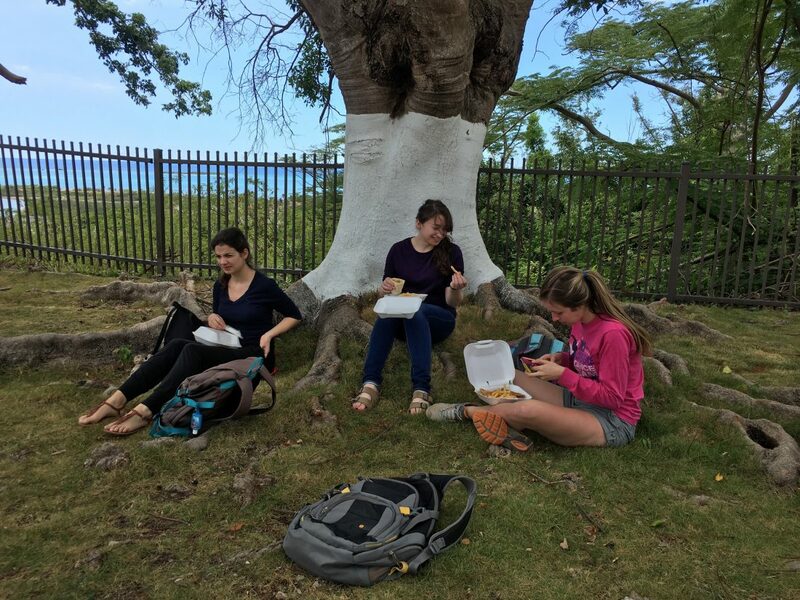 Along with local students, everyone enjoyed the fresh time. 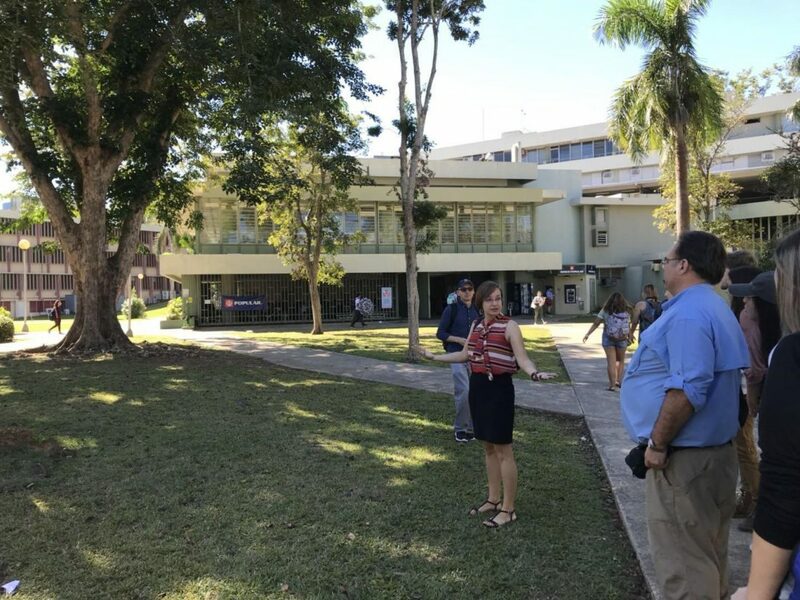 After snack time, we had a great time visiting the UPRM campus. Located at west edge of the island, UPRM has a fantastic tropical style. 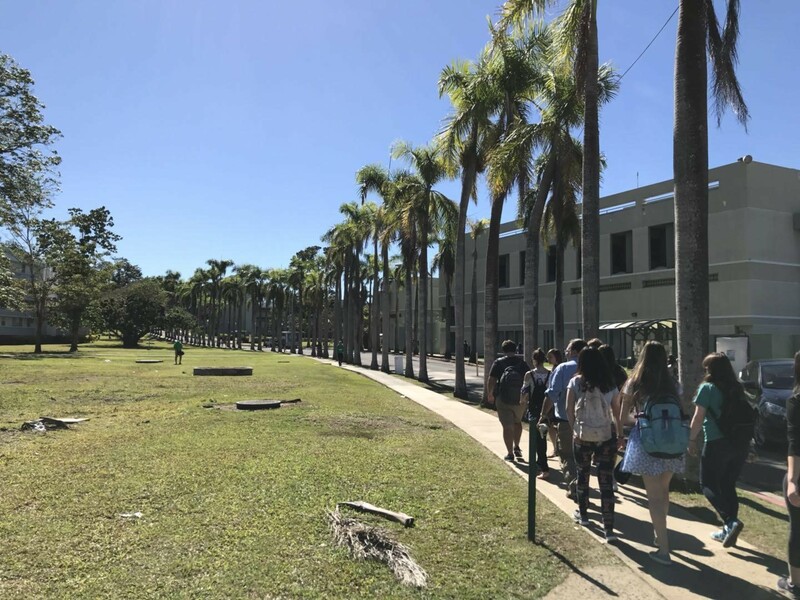 Walking along coconut palms, students became familiar with the university and its history. It is said that Mayagüez rains every afternoon at 2pm, we were kind of “regretful” for missing that. 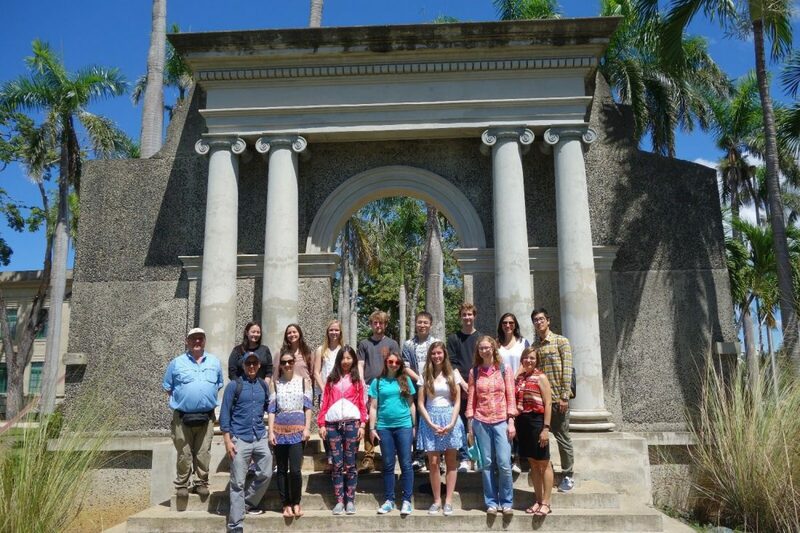 So we took a great group photo at a landmark of UPRM with beautiful sunshine. After a lunch of seafood along a beach, we went back to UPRM visiting their environmental engineering lab. Graduate students of UPRM introduced research they are focusing on and what equipment they have. One of their highlighted research areas is experimenting on filters with plastic media. They also introduced research about UV light disinfection and groundwater contaminant removal. 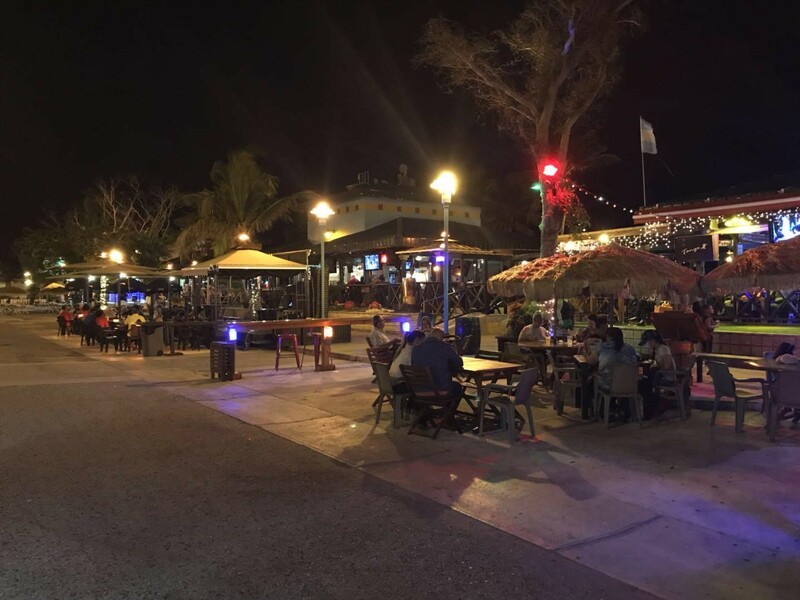 At night, we went on an adventure exploring local life experience in Ponce. 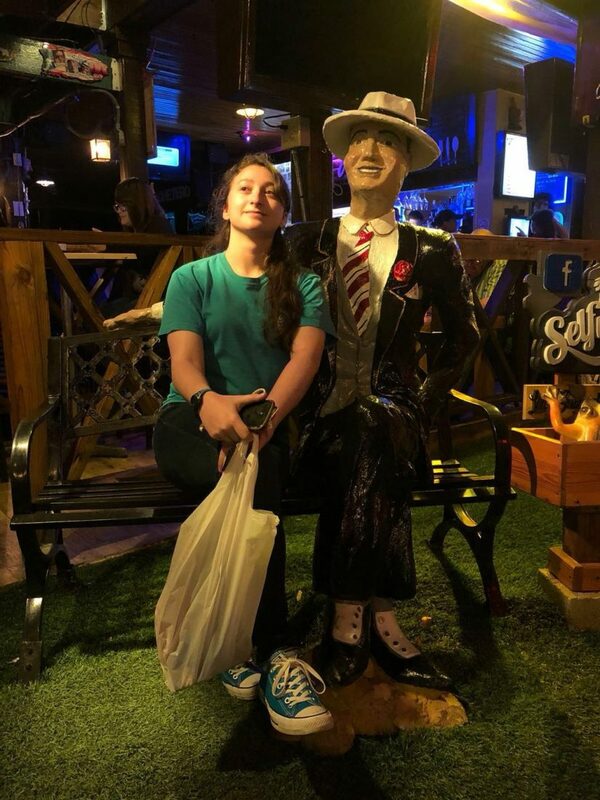 Students bought some souvenirs and enjoyed live music there. It was a special experience enjoying live heavy metal music performance with zero distance. (and without headphones). 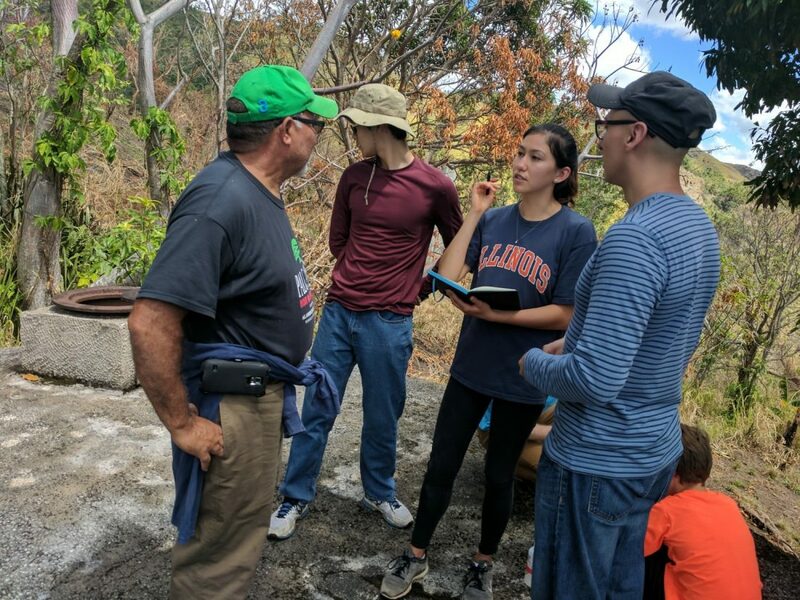 At the first pit stop, the team sampled water from a tank that supplies the water for 150 homes in Sierritas. The tank is gravity fed from a source up the mountain. No treatment is done besides a wide filter at the entrance of the intake pipe to block leaves or other large debris. The only way to sample the water was to climb to the top of the tank. Volume of the tank and flow rate were estimated by Esteban, Kevin, Jacqueline, and Bernardo (pictured in this order). 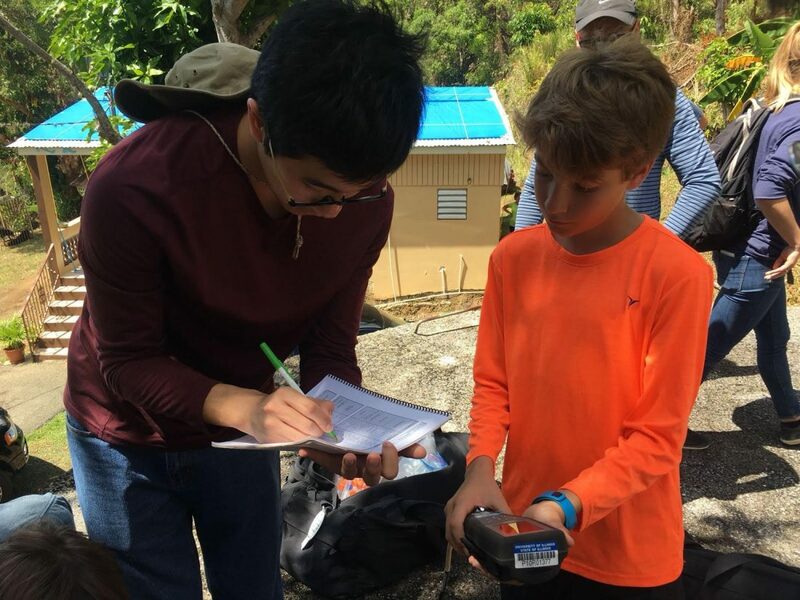 Adrian oversaw Kevin’s data input to make sure the results were recorded accurately and learned how to use an Horiba probe. The next pit stop on the team’s agenda included a hike up to the Sierritas water source and a few community member interviews. 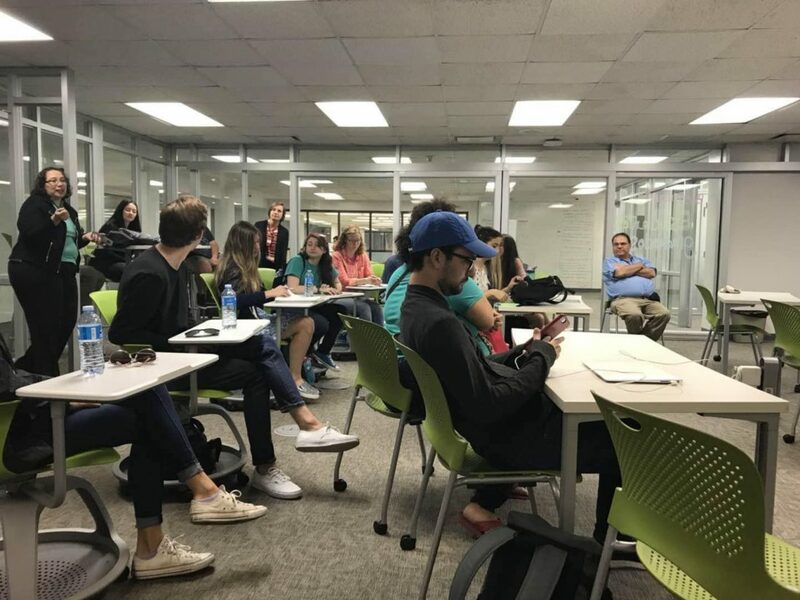 The students split; many hiked while a few with an expertise in Spanish stayed behind to conduct the interviews. The hike featured many physical obstacles for the team, but the guidance of Esteban and a special animal friend helped lead the way. 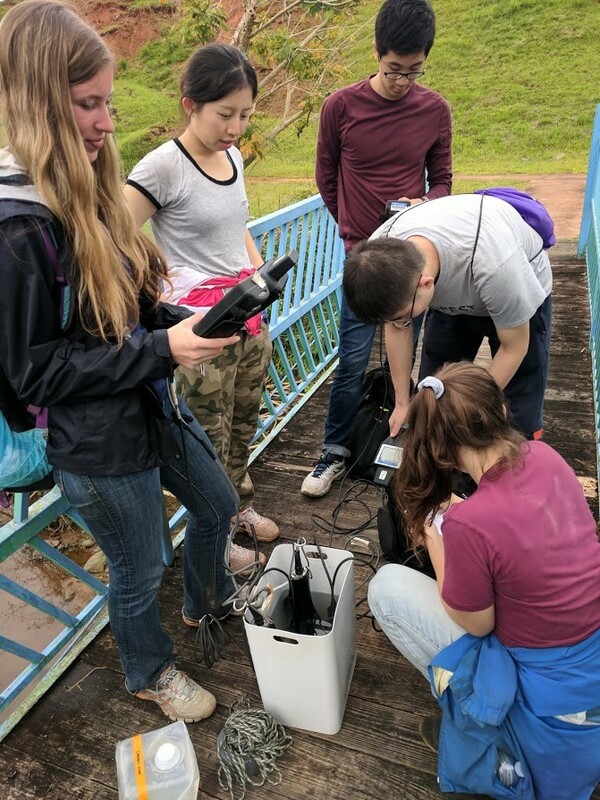 Once making it to the water source, the team took samples and performed on-site tests. The YSI and Horiba probes were used to test pH, dissolved oxygen, chloride, nitrate, and more, while fluoride and ammonia tests were also performed. 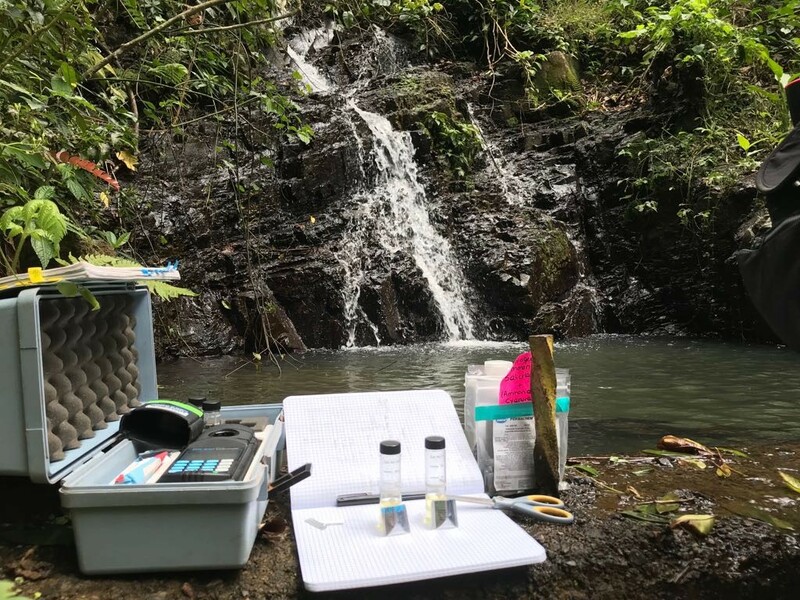 A surprising discovery was the presence of free chlorine in the source water – the team suspects that the test reading is not in fact a value for chlorine concentration, since the presence of chlorine is unlikely in untreated surface water. Further analysis was required to elucidate these results. 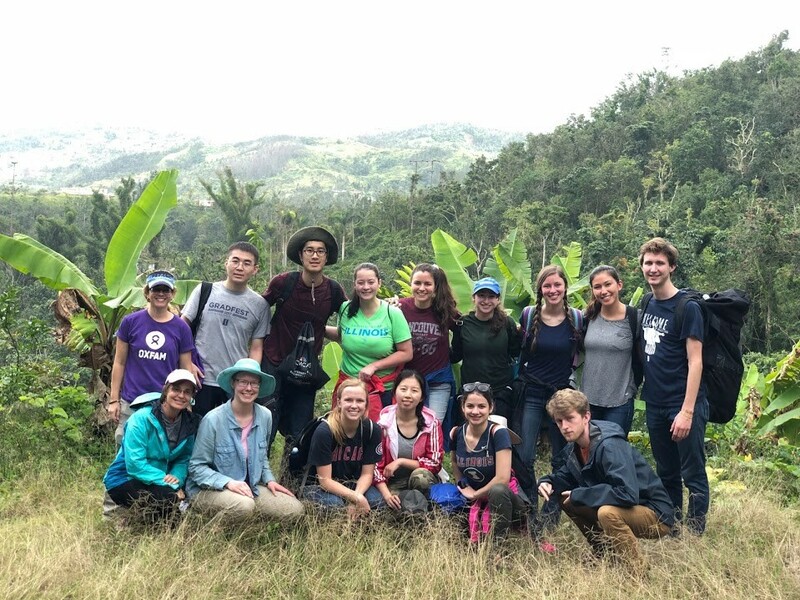 After a successful hike back down to the Sierritas water tank and our cars, the team headed into the community to meet up with the team members who had been conducting interviews. More water samples were taken at three of the community members’ homes. 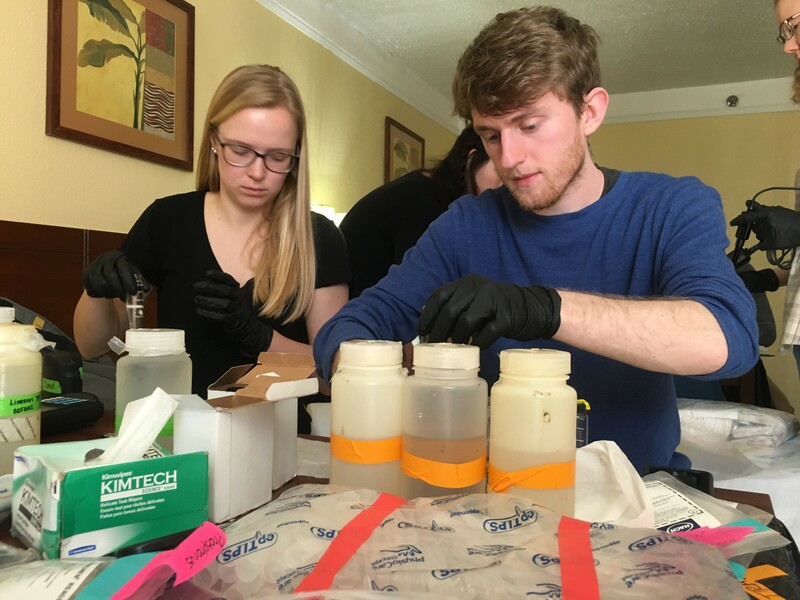 Interestingly enough, one of the water test results revealed data that varied from the other water samples in the communities. This may indicate that for this community member the water comes from a different location than the source water (i.e PRASA). 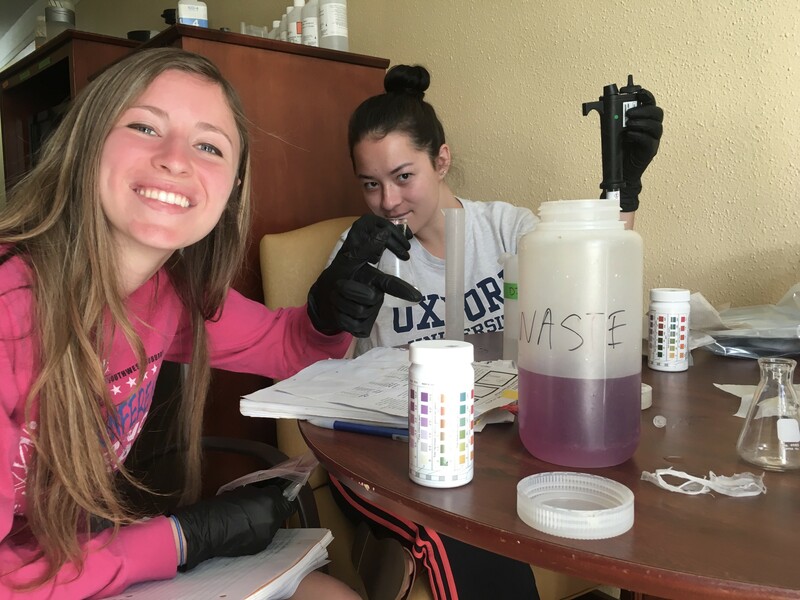 The evening came to a successful close after microbial, metal, and alkalinity and hardness analysis were performed back at the hotel. By day 4, the students worked much more efficiently and were able to test all their collected samples fully within about an hour. 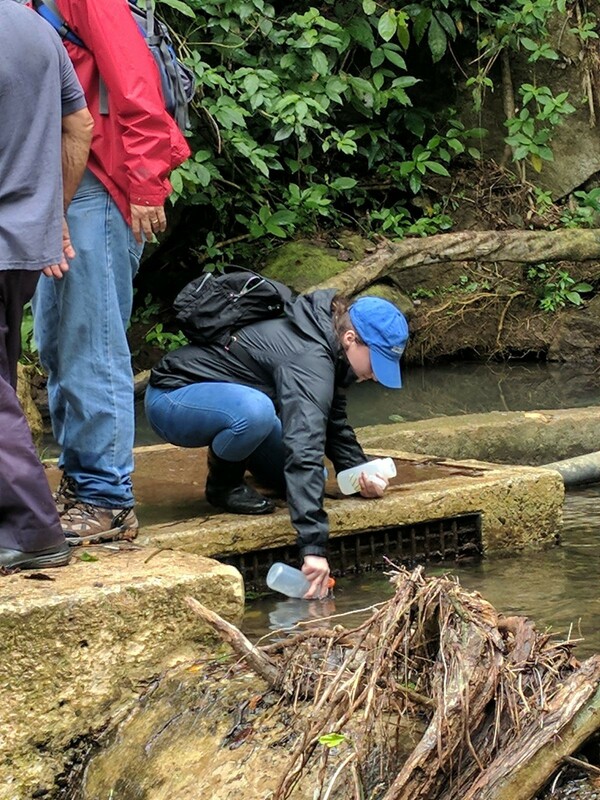 Day 3 for the travel team was focused around testing the sampled water from Los Duros, Orocovis taken the day before. There were 9 samples taken from 3 sites: the spring, the homes in the community, and the Limones water treatment plant. Specifically, we tested for copper, iron, manganese, sulfate, sulfide, iodide, alkalinity, hardness, and pH. These tests require reagents and equipment that are not easily transported to the field, which is why it is lab work. The lab of the day was the hotel room 407. It was interesting to observe the levels of contaminants in the samples, and note when they exceeded the World Health Organization standards. This will be useful information for the team to take into consideration when developing our design recommendations. 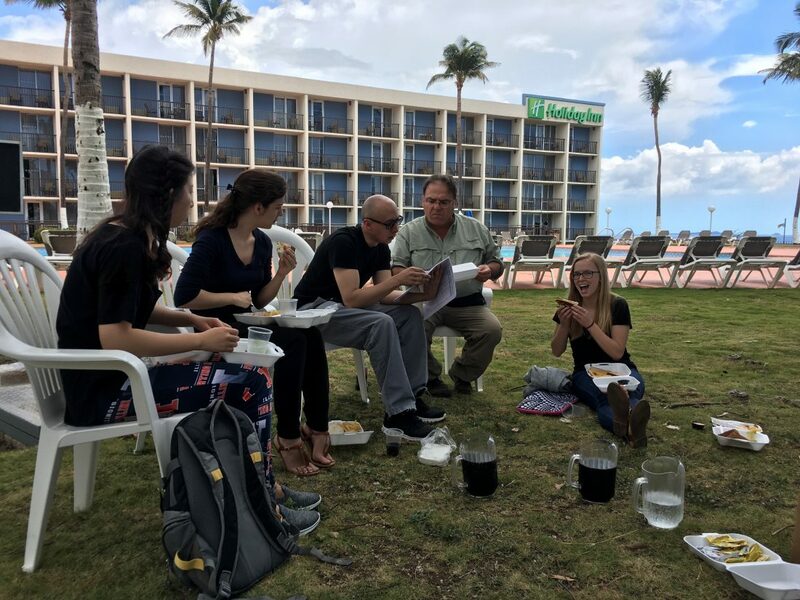 We had a team meeting to discuss observations and possible project ideas, comparing interview notes and data to gain a stronger understanding of the potential challenges that lie ahead. We ventured outside for lunch to enjoy the nice weather, ocean views and each other’s company. Tomorrow we will have the opportunity to visit another community in the municipality of Villalba to take samples, interact with community members, and evaluate the potential of a project there. After two days of strenuous labor, we were able to do much needed loads of laundry, relax, and catch up on homework. For dinner we switched it up and ate seafood in Ponce, at a restaurant that overlooked the ocean. 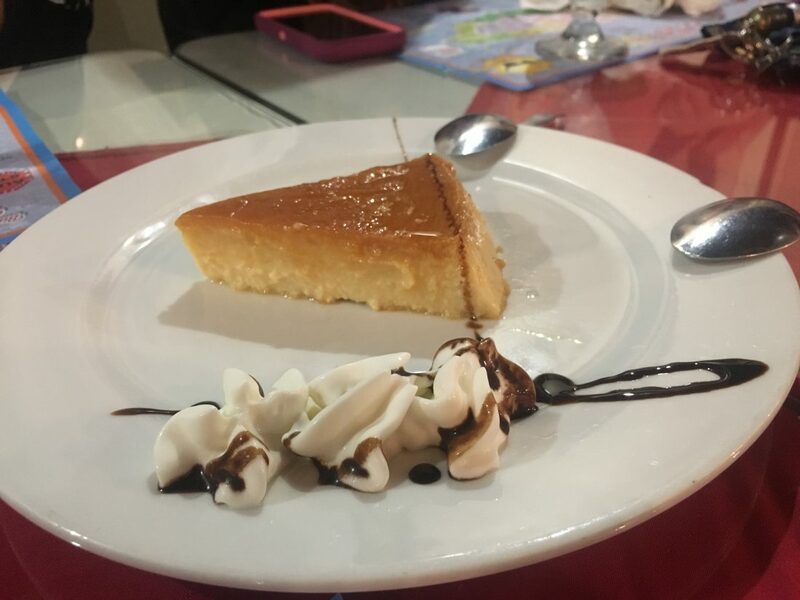 A highlight included the pumpkin and cheese flan, which we all shared and quickly devoured. Although we have become accustomed to the sounds of roosters calling, the metaphorical morning crowing came bright and early today. 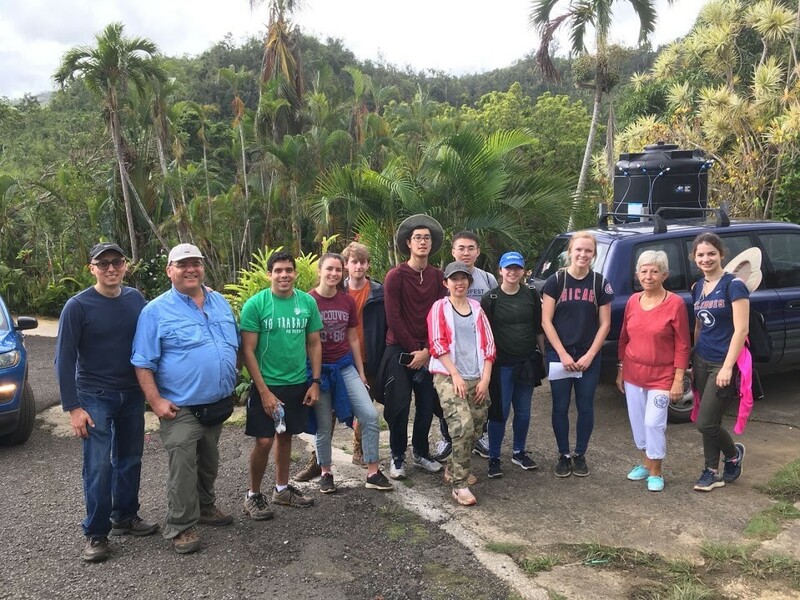 After a breakfast of scrambled eggs, French toast, and potatoes, we loaded all of our gear into the car to begin the long trip to Los Duros, a community in the Orocovis municipality. 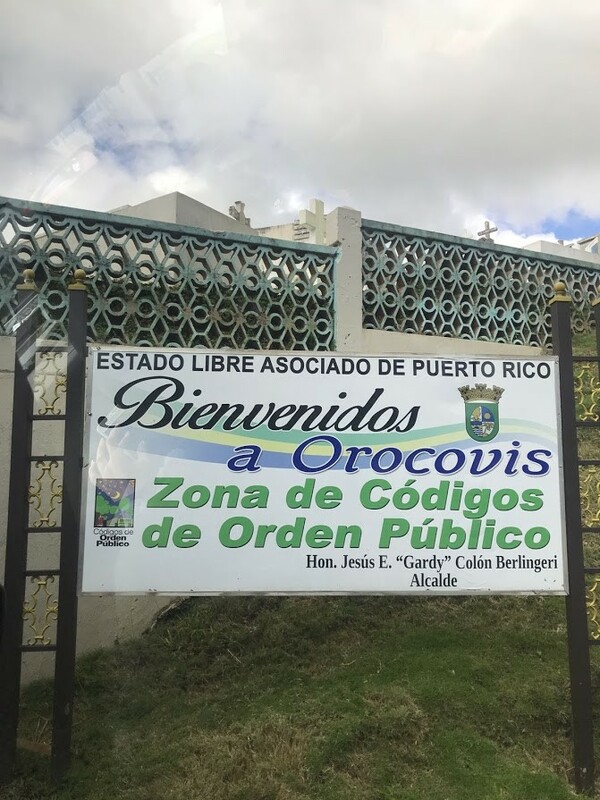 Known as the geographical and cultural heart of Puerto Rico, Orocovis is the most distant community that we will be visiting from our base camp in Ponce. 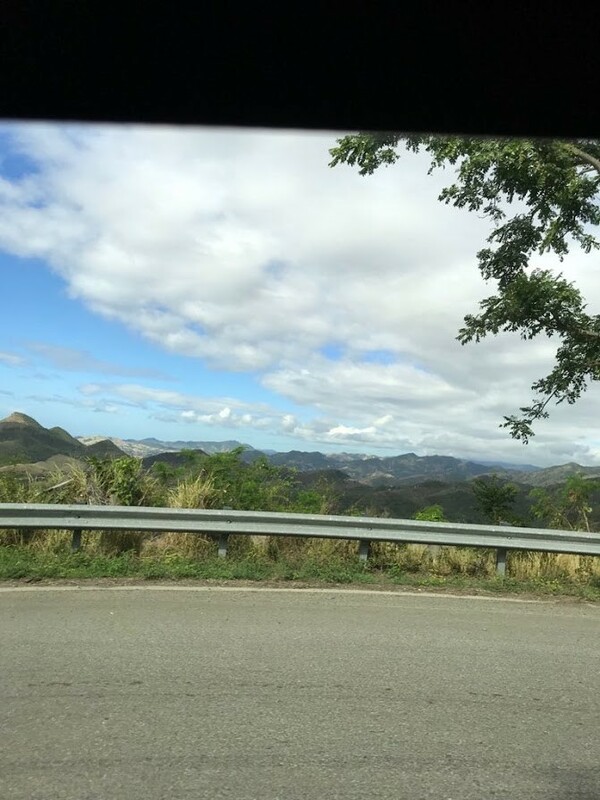 A legend regaled to us by our guides states that the winding mountainous roads are a result of drunken Spanish colonists following their equally clueless donkeys as they laid the stones connecting Ponce and San Juan. Today, the hazards along the road are more hidden. 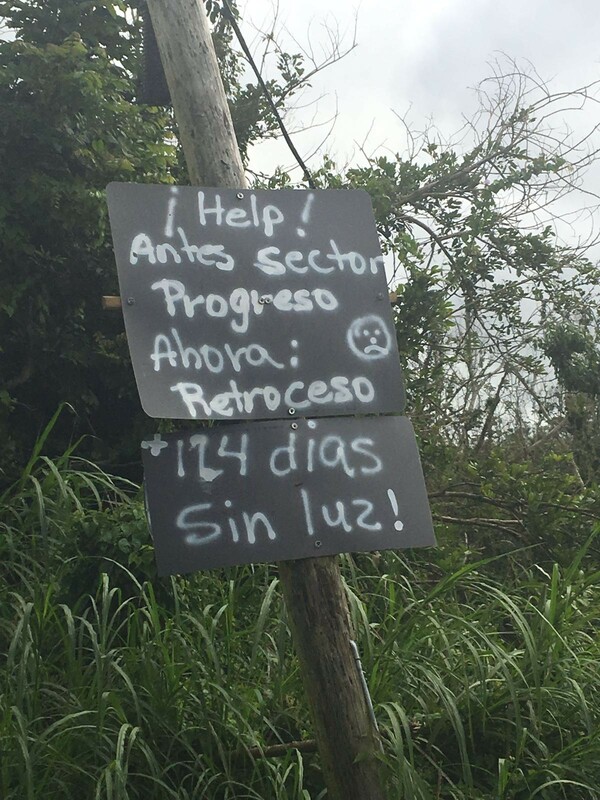 Communities have put up signs to inform passing motorists that they have been without electricity for over 124 days. Schools without power have led to classes being taught in the dark or students having to travel long distances. 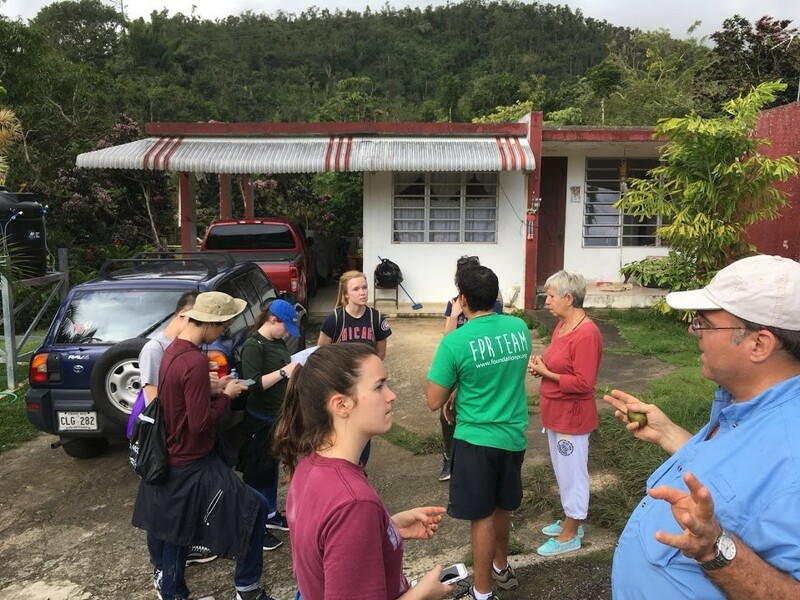 Along the way, we made a stop at a hospital facility in central Orocovis to meet Thalia Martinez (who would help us with translation) and Brenda Guzman (our Oxfam collaborator who has expertise in water treatment in the mountainous villages). 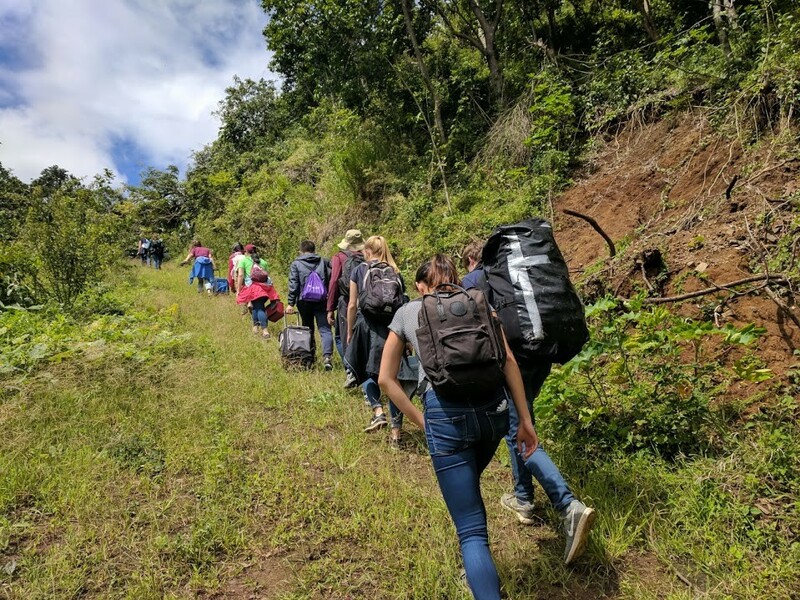 Upon arrival in Los Duros, the travel team collected all of our gear and began the trek up a steep hill and through a dense forest. After climbing over logs and under exposed pipes, we found a waterfall flowing into a stone basin. 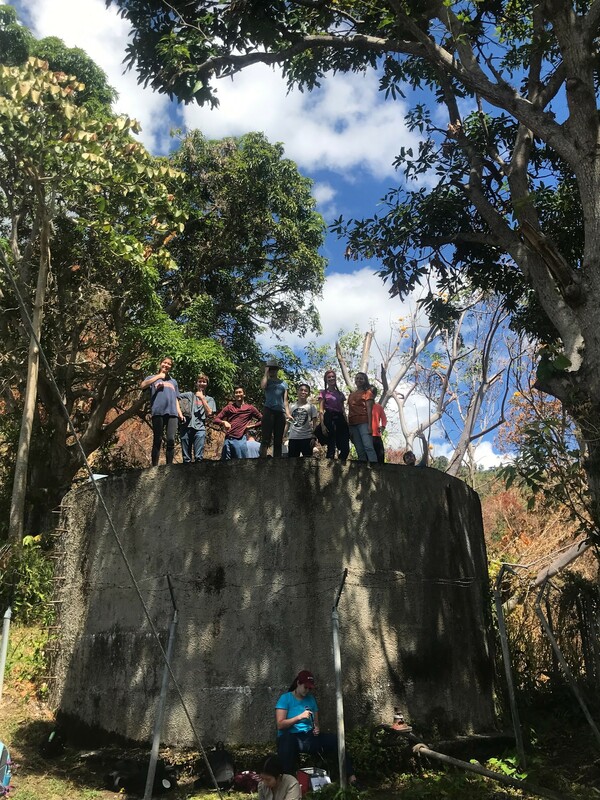 We learned that the water containment structure was built by a resident’s relative approximately 100 years ago and has served the community ever since. Each student performed their own role and collected and tested water samples. 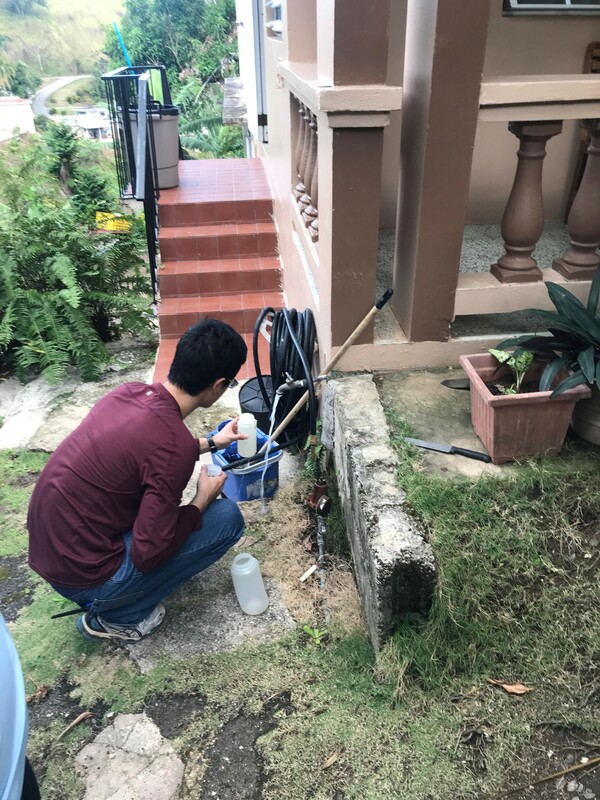 Once all these tasks were completed, we returned to “La Casa de Ana” to take water samples from her home and have a lunch break. 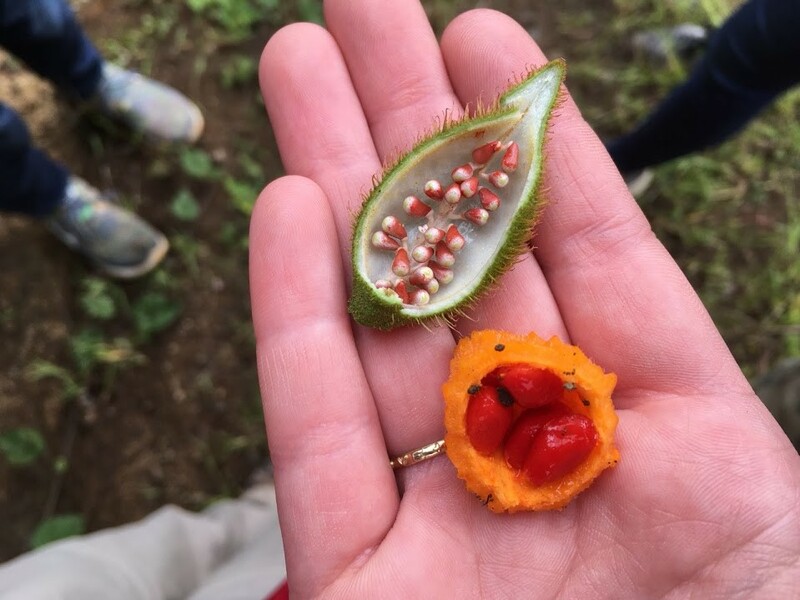 Along the way, we found some interesting new fruits to try. We then performed interviews with several residents of the Los Duros community regarding their water usage, water concerns, and the effects of the hurricane. With the assistance of our guides Christian, Thalia, and Carlos, we were able to successfully translate our prepared questions. 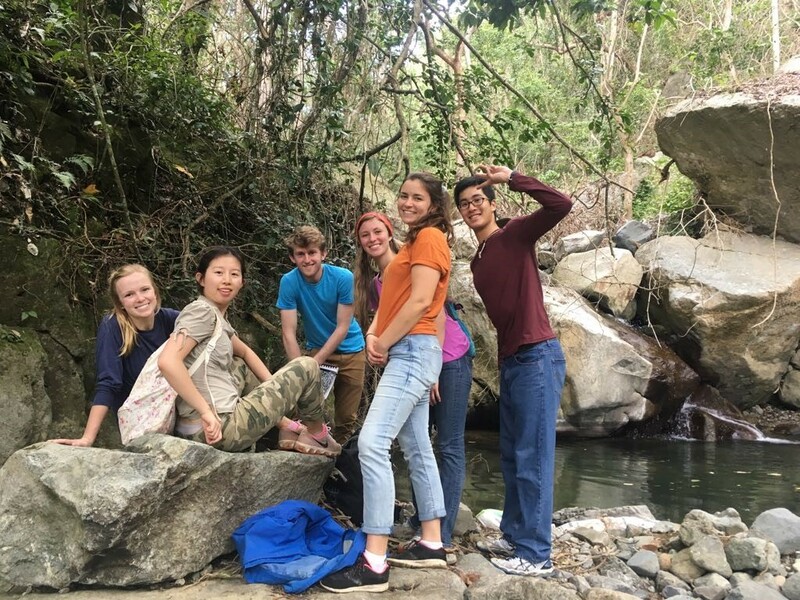 These interviews taught us that most residents of Los Duros were not comfortable drinking the water coming from the river source. However, they used the water for everyday applications such as cooking and bathing. A resident of the community told us that only one in ten residents had access to water from the governmental aqueduct firm PRASA. Other residents stated that the hurricane was a terrifying experience and one that still affects their community today. After leaving Los Duros, we stopped to visit a Riverbank Filtration Plant that utilizes chlorine disinfection. 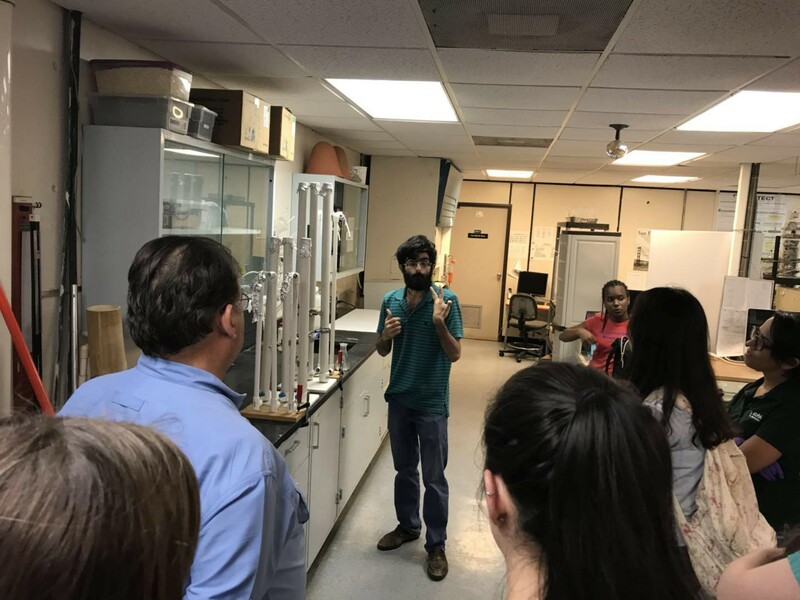 While at the plant, Professor Mariñas expressed concern that the specifications of the plant’s operation may lead to an excess concentration of chlorine in the water that was being supplied. 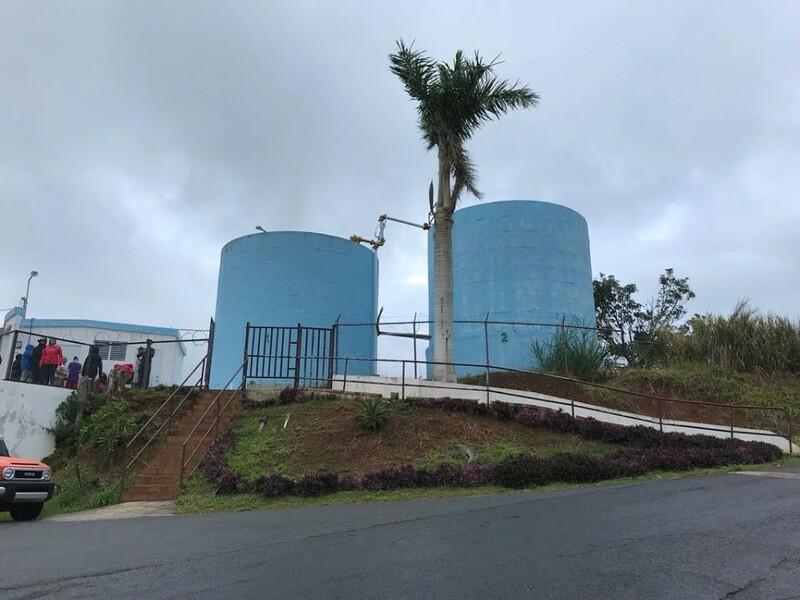 We ran tests at the filtration site before moving up the hill to see the holding tanks where water from the plant was held before being distributed to 250 homes in Orocovis. With rain coming down, we made the long trip back to the hotel in Ponce to eat dinner, clean up, and run some more water quality tests. After a long day of travel on Sunday, we finally arrived at our hotel in Ponce around 8 AM. 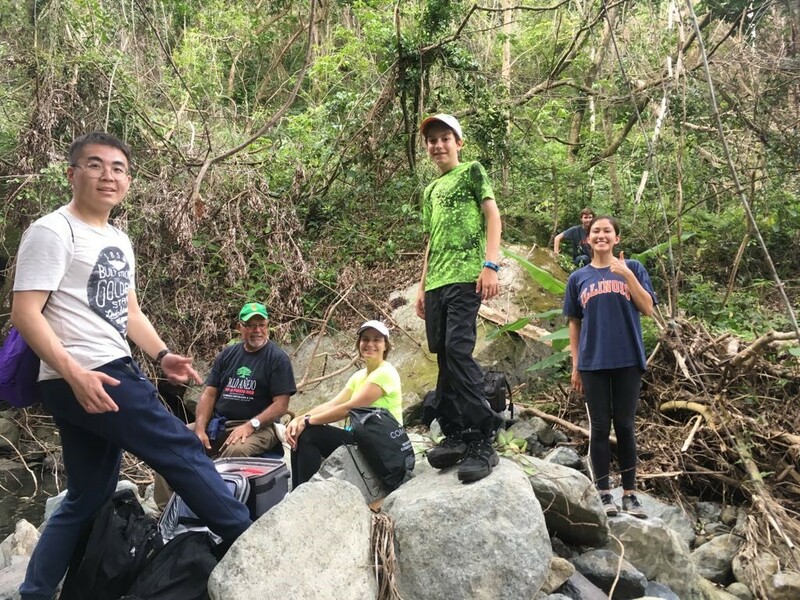 After having some time to rest from the trip, we met for a conference with Brenda Guzman, our OXFAM collaborator, Madeleine Torres, our University of Puerto Rico Mayaguëz partner, and Fabian and Thalia, our guides. We planned out our week and which communities we would visit each day. 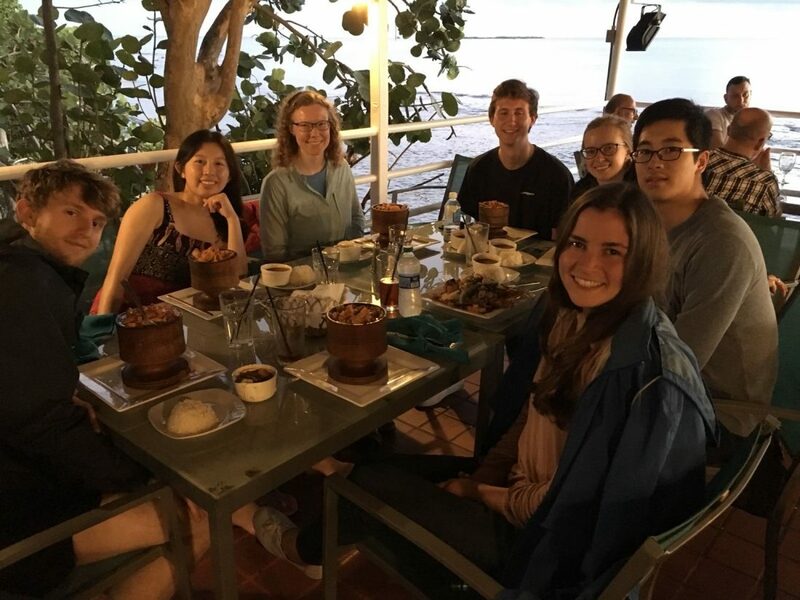 Afterwards, we ate dinner at a seaside restaurant. 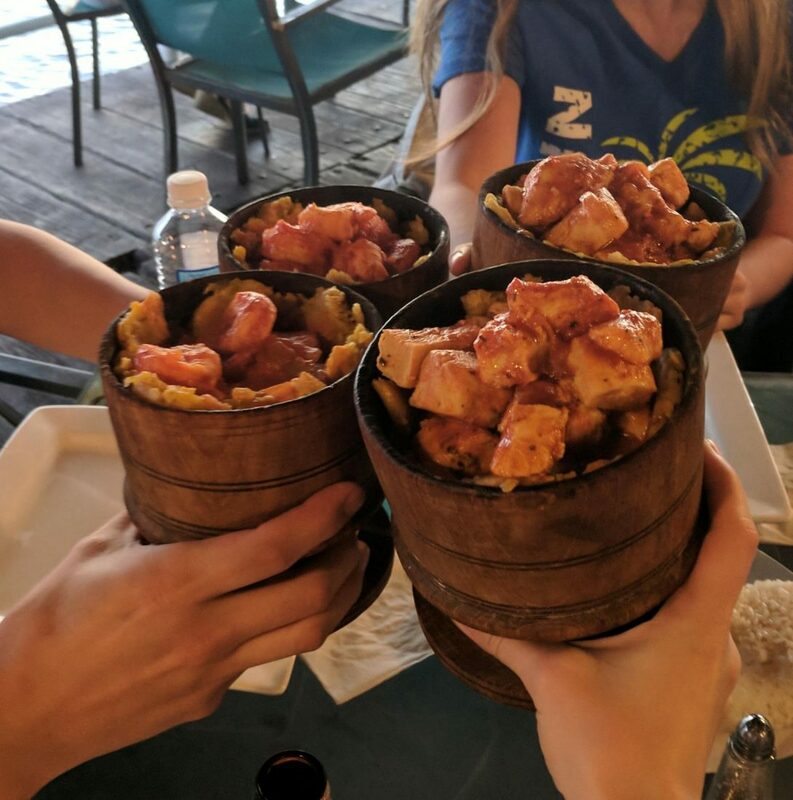 Lots of people ordered mofongo, a traditional Puerto Rican dish with mashed fried plantains topped with a creole stew of meat or seafood. 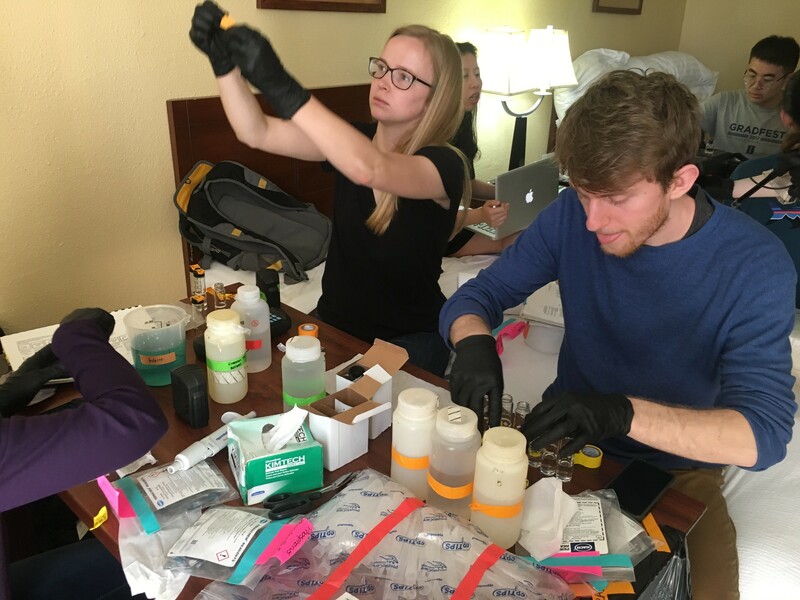 After dinner, we returned to the hotel and organized and calibrated our instruments for the sampling that would take place the next day. On Monday morning, we were ready to go to Corea Metralla, a mountain community in Peñuelas. Our guides hit traffic on their way from San Juan and could not join us. Nonetheless, we loaded up our SUVs and drove through winding, steep, and narrow roads towards the water source of the community. 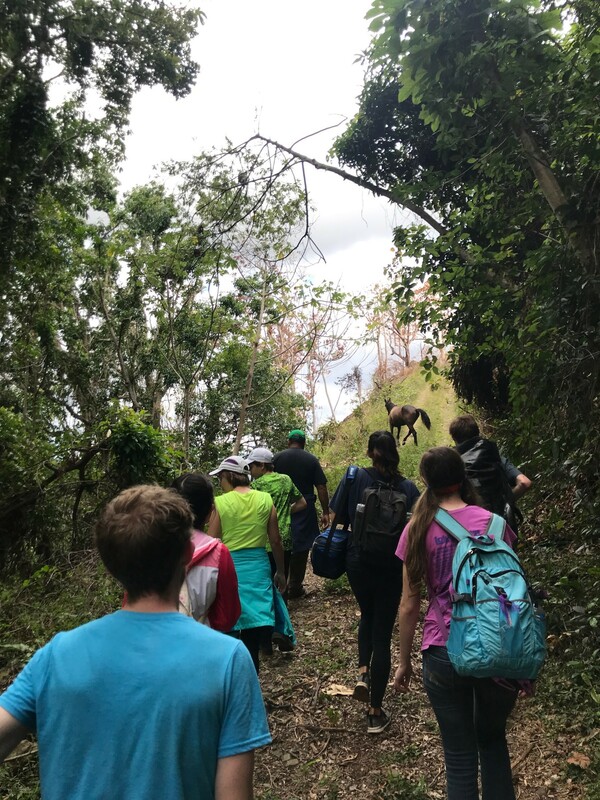 A resident of the area, met with us to hike directly to the water source. 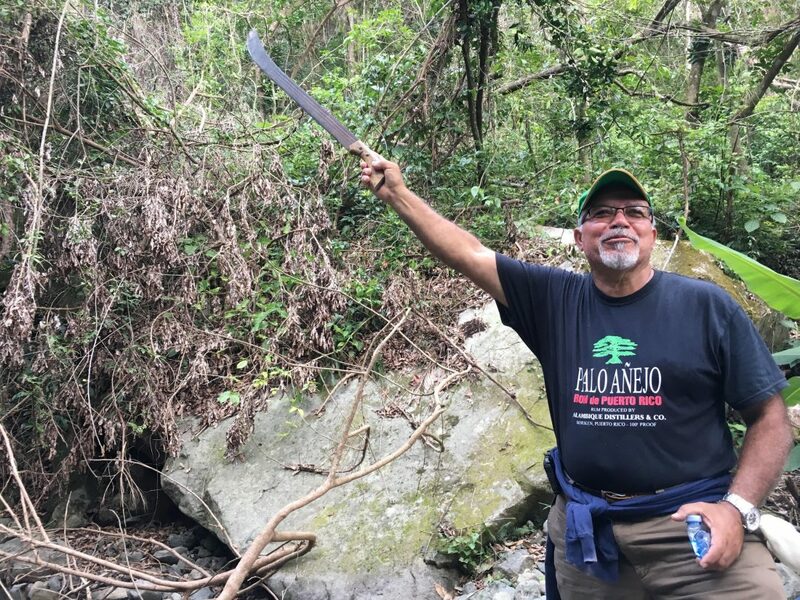 He carved out the way with his machete, pointing out a plant used as an ingredient in cancer medicine. We arrived at a rocky stream with a concrete structure with a filter. We collected our water samples and then hiked back up to the residential area. 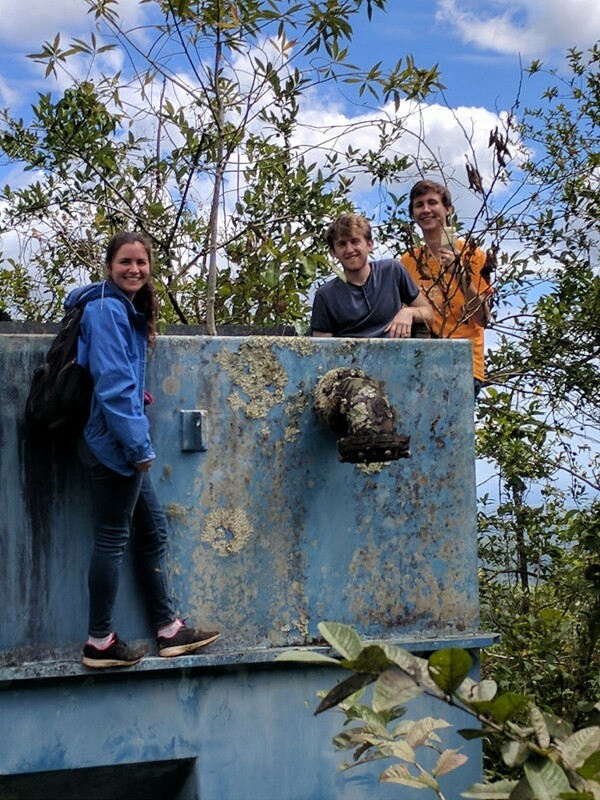 Next, we explored an abandoned water treatment area, with a filtration unit (which George and Melanie climbed inside to sample) and an underground concrete water storage tank. 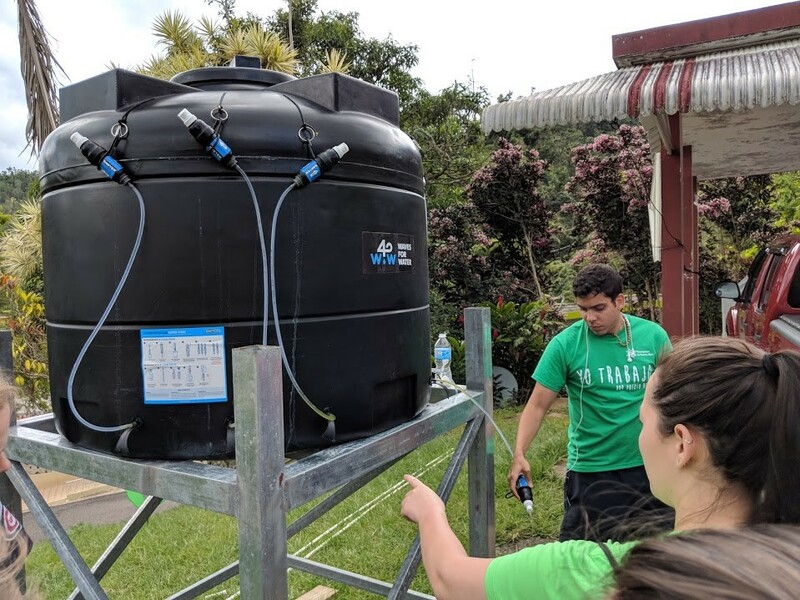 Benito explained that by estimating the dimensions of the tanks, we could estimate the volumetric flow rate and the number of people served by the system. After lunch, a community member showed us his property where he grows cacao, coffee, beans, and various other plants. 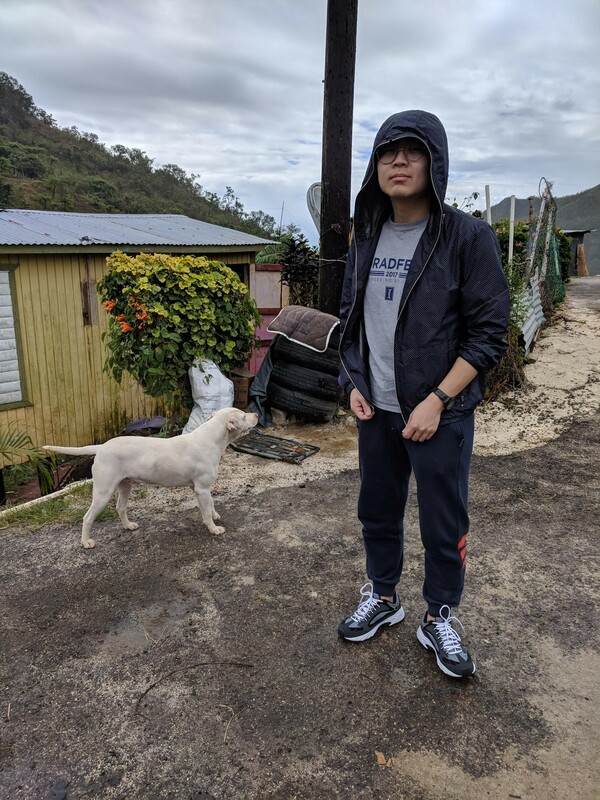 We had learned that he used to grow and farm his own coffee, however, his entire farm got destroyed when Hurricane Maria occurred. He’s working slowly but steadily to rebuild his farm. We befriended his sweet and cuddly dog, Toby. After dinner at the hotel, we conducted more tests on the water. We also discussed what we could improve upon to make the next few days go smoother.